^ 韩东育. “壬辰倭乱”与明廷的“朝鲜保全”. 读书. 2012, (10): 11–16. Kim, Kichung. 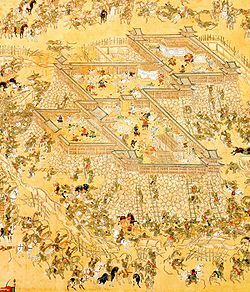 "Resistance, Abduction, and Survival: The Documentary Literature of the Imjin War (1592–8)." Korean Culture 20:3 (Fall 1999), pp. 20–29. 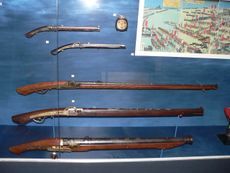 桑田忠親 [Kuwata, Tadachika], ed., 旧参謀本部編纂, [Kyu Sanbo Honbu], 朝鮮の役 [Chousen no Eki]　(日本の戦史 [Nihon no Senshi] Vol. 5), 1965. 이민웅 [Lee, Min-Woong], 임진왜란 해전사 [Imjin Wae-ran Haejeonsa: The Naval Battles of the Imjin War], 청어람미디어 [Chongoram Media], 2004, ISBN 89-89722-49-7. Niderost, Eric. 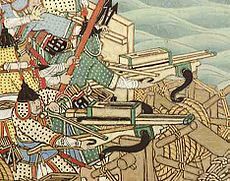 “Turtleboat Destiny: The Imjin War and Yi Sun Shin.” Military Heritage 2:6 (June 2001), pp. 50–59, 89. Sadler, A.L. 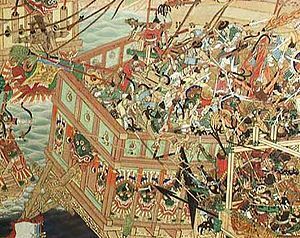 "The Naval Campaign in the Korean War of Hideyoshi (1592-1598)." Transactions of the Asiatic Society of Japan Second Series, 14 (June 1937), pp. 179–208. Stramigioli, Giuliana. "Hideyoshi's Expansionist Policy on the Asiatic Mainland." Transactions of the Asiatic Society of Japan Third Series, 3 (December 1954), pp. 74–116. 桑野栄治. 東アジア世界と文禄・慶長の役―朝鮮・琉球・日本における対明外交儀礼の観点から― (PDF). [2012-03-21] （日语）. 李啓煌. 韓国と日本学界の壬辰倭乱原因論について (PDF). [2012-03-21] （日语）. 中野等. 文禄・慶長の役研究の学説史的検討 (PDF). [2012-03-21] （日语）. 盧永九. 壬辰倭乱の学説史的検討―韓国の研究を中心に― (PDF). [2012-03-21] （日语）. JINJU National Museum. 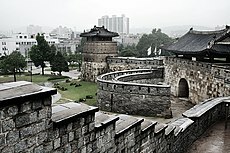 韓国・国立晋州博物館（국립진주박물관）. 国立晋州博物館（국립진주박물관）. [2012-03-21] （日语）. - 文禄・慶長の役（壬辰倭乱）を専門にした韓国の歴史博物館のサイトの日本語版. "당인춤"의 박물관. 韓国ドラマに描かれた藤堂高虎. 資料館「唐人さんの家」（"당인춤"의 박물관）. [2012-03-21] （日语）.